Boom Brothers is a NetEnt slot that gives you the chance to dig deep in a mountain full of precious stones. You can join the dwarf miners in your attempt and they will be happy to help you find the precious gems. 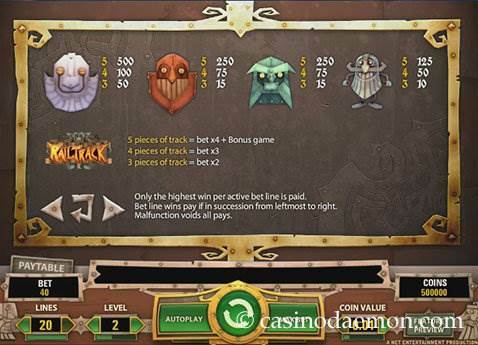 The symbols, as well as the music and sound effects of the slot, are entertaining, and together with the special features they provide for good entertainment. The special features include free spins with tripled winnings, a rail track bonus game, a second chance bonus and wild substitutions. The variance of the game is medium to high, and since the game has special features it should be played for a little while, at least until you trigger the bonus game or free spins, as you can win most money during these. The theoretical return to player is 94.6%-96.4%, depending on how many lines you activate. We recommend playing with all pay-lines activated. 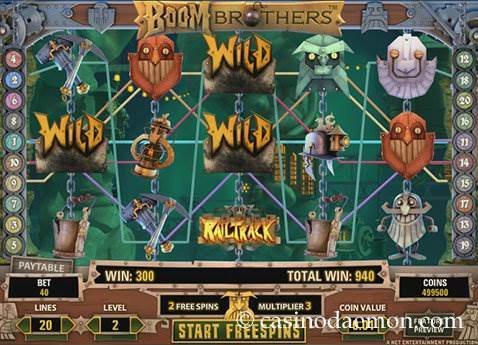 Unfortunately, Boom Brothers is not available for mobile, which means that you can only play the slot on Flash-supporting desktop computers or other devices. The slot is laden with special features, starting with a wild joker symbol that can act as a stand-in for other symbols to form winning combinations, but it cannot stand in for other special symbols. The free spins start with at least three free spins symbols and all winnings from the free spins are tripled. How many free spins you get is determined at random and can be between 8 and 50 free games. The bonus game starts when the railtrack pieces on all reels are connected. If you get them on the first three reels they will be held and other reels re-spun for a chance to get all 5 railtrack pieces. 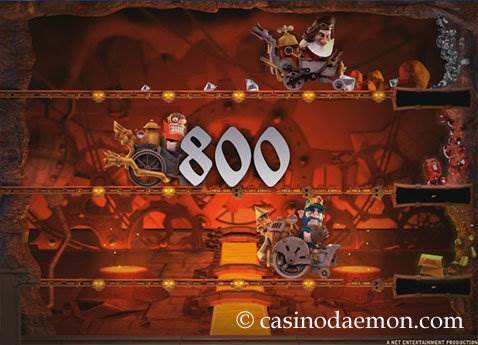 The bonus game is a race of the dwarves along the tracks where you can win coins with rubies, diamonds or gold. 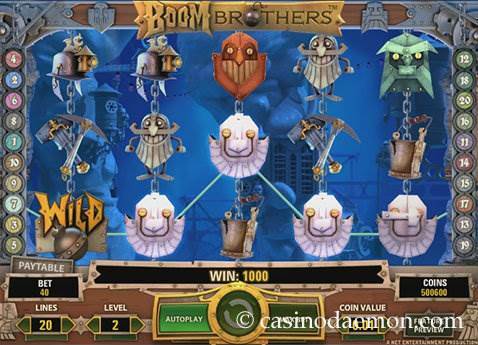 Boom Brothers slot has 5 reels with 20 variable pay-lines. You can play the game with coin values of 0.01 up to 1 £/$/€ and play up to 5 coins per line. The minimum in one spin is 0.01 for one activated pay-line, 0.20 £/$/€ for all win lines and you can raise the bet up to a maximum of 100 £/$/€.